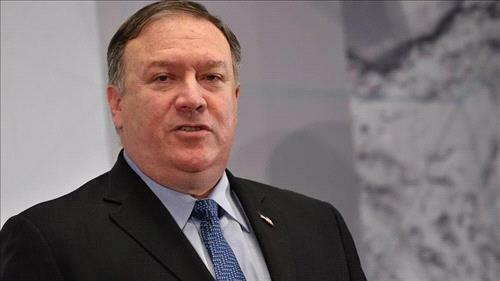 AMMONNEWS - US Secretary of State Mike Pompeo said on Wednesday that Iran is behind threats directed against the United States diplomatic missions in both Iraqi cities of Baghdad and Basra. “Iran is the source of the current threat to the Americans in Iraq... Our intelligence is strong in this regard, we can see the hand of Ayatollah and his followers supporting these attacks on the United States,” he told reporters at the State Department. Pompeo hoped that “the Iraqi government is not subject to Iranian dictates,” stressing that Washington will always stand “side by side with the Iraqi people,” expressing his hope that the Iraqi Prime Minister would honor his commitments to the Iraqi people. Pompeo said his country had already taken measures to avoid harming Iran’s humanitarian needs and that the ruling “categorically rejected all unfounded demands by Iran” to lift US sanctions in a comprehensive way. He stressed that Iran is exploiting the International Court of Justice for political purposes. On another development, Pompeo said that the US administration was terminating a 1955 treaty reached with then ally Iran after Tehran cited Washington in an international court ruling against America’s sanctions policy, according to AFP. “I’m announcing that the US is terminating the 1955 Treaty of Amity with Iran. This is a decision, frankly, that is 39 years overdue,” Secretary of State Mike Pompeo told reporters, referring to the 1979 Islamic revolution. Meanwhile, national security adviser John Bolton said the administration also was pulling out of an amendment to the Vienna Convention on Diplomatic Relations that Iran or others, notably the Palestinians, could use to sue the US at The Hague-based tribunal. Bolton told reporters at the White House that the provision violates US sovereignty. “The United States will not sit idly by as baseless politicized claims are brought against us,” Bolton said. He cited a case brought to the court by the “so-called state of Palestine” challenging the move of the US Embassy in Israel from Tel Aviv to Jerusalem as the main reason for withdrawing, according to the Associated Press. Bolton, who last month unleashed a torrent of criticism against the International Criminal Court, noted that previous Republican administrations had pulled out of various international agreements and bodies over “politicized cases.” He said the administration would review all accords that might subject the US to prosecution by international courts or panels.